Knit wear designer, Theresa Almeida will teach the basics of Brioche knitting. 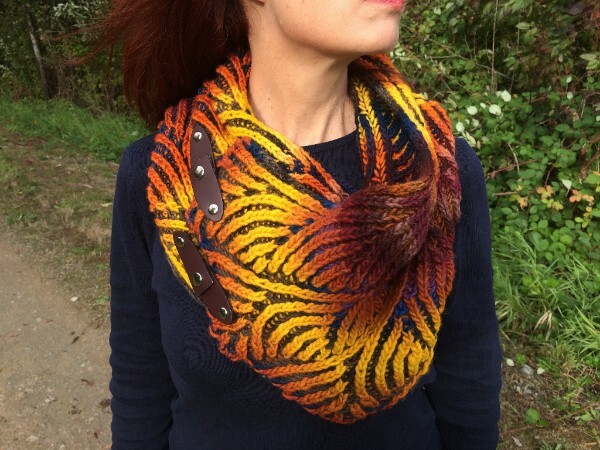 You’ll cast on and begin to knit your very own Salish Sighs cowl! $85 + materials. Kits and other materials will be available at Bazaar Girls Yarn shop. Techniques: Fiber selection for Brioche, Italian Two Color Cast On, Bark and Burp (creating Plain Brioche fabric), counting stitches in Brioche, increases, right and left decreases, tensioning, syncopation, and Italian Cast- Off. Student Supplies to bring or purchase: Notions Kit, 16″ or 24″ Size 6, 7, and 8 circular needles, Non-Superwash Worsted Weight yarn for learning with, the Spincycle Kit (which includes two skeins Spincycle Independence Yarn, Salish Sighs Pattern, one set of Jül closures) or any non-superwash worsted weight yarn, a set of closures, Salish Sighs Pattern, and pencil/paper for notes.